The corking machine can handle corks with a maximum measurement of up to Ø 30 x 50 mm (on request). Corks bottles and straw-covered flasks of any height, by regulating the bottle lifter load plate with an automatic sensitized block which eliminates any possibility of breakage (With a safety solution in the bottle lifter load plate). Manual loader with a capacity of about 200 corks. Also designed for corking with synthetic corks. 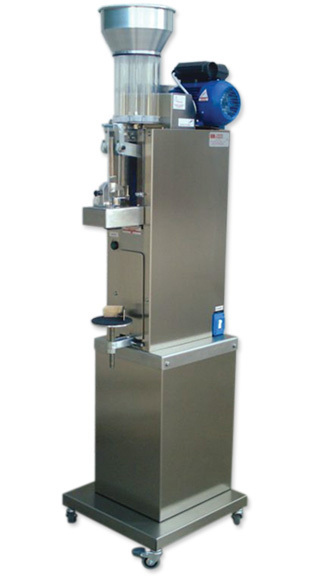 The corking machine is available with a vacuum kit (to create an automatic vacuum between the wine and the lower part of the cork) or a nitrogen kit (which introduces a small amount of inert gas between the wine and the lower part of the cork). The corking machine also has a useful object/bottle holder located at the base with wheels, although it can also be used on a work bench. Version structured entirely in stainless steel AISI 304, or varnished. Various options are also available.